Diamondhead, Mississippi is a most unique resort and retirement community. Diamondhead provides a private setting with a Country Club life-style. Its location, elevation and overall size make it an exceptional residential community on the Mississippi Gulf Coast. Its climate has an average daily temperature of 68 degrees punctuated by an average of 300 days a year of golden sunshine. Diamondhead enjoys mild weather conditions, ranging from 50 to 75 degrees in November and December. Summer breezes off the Gulf of Mexico and the Bay of St. Louis usually keep the weather in the 75 to 90 degree range. The Coastal summers provide a year-round attraction for people from all over the world. Summertime draws many southern residents and visitors seeking a family vacation spot in a resort setting. Diamondhead provides a series of lifetime pleasures and experiences for those who want to live in paradise. Residential home-sites or select condominiums offer fun time living surrounded by fabulous facilities. Diamondhead is but an hour of easy driving from New Orleans or Baton Rouge, Louisiana; or, an hour and a half from Mobile, Alabama; and an hour or two from many locations throughout Mississippi. A significant number of Midwesterners have found Diamondhead to be an ideal location for their second home and a place to retire. Much of the Midwest is but a one day drive. Access to both private and public air transportation is most convenient. Moisant International Airport at New Orleans is a little more than an hour's driving time and the Gulfport/Biloxi Regional Airport is less than a half hour away. Diamondhead has its own private Airstrip providing hanger space or tie down facilities. The attractions, due to location and weather, are many. They include two golf courses, tennis courts, and a population of amiable residents who add to the joie de vivre. Diamondhead, often abbreviated to D'head, is without traffic congestion --- no crowding, low stress, low cost of living, and a safe-zone, literally free of crime. D'head is accessible to the Gulf Coast by several exits along the ribbon of Interstate I-10. 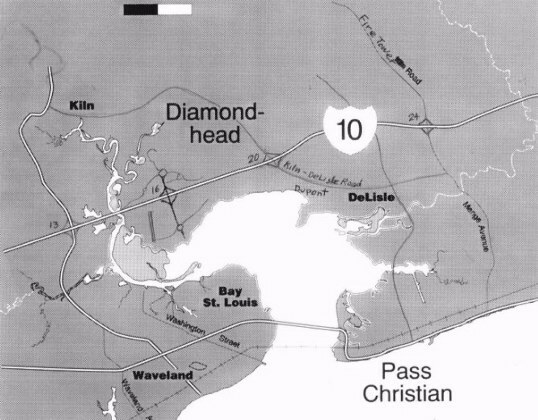 The white sand beaches and antebellum homes at Bay St. Louis/Waveland and Pass Christian can be reached by less than 10 miles of roadway.